Branson is not only famous for its world-class live entertainment shows, it is also a great vacation destination for those who want to enjoy outdoor adventures. It is also a popular vacation destination in the Midwest because of its intriguing museums, exciting attractions, theme parks, and great shopping. Visitors who want to spend a wonderful vacation in the Ozarks always include a great outdoor fun in Branson either on land or on the water. 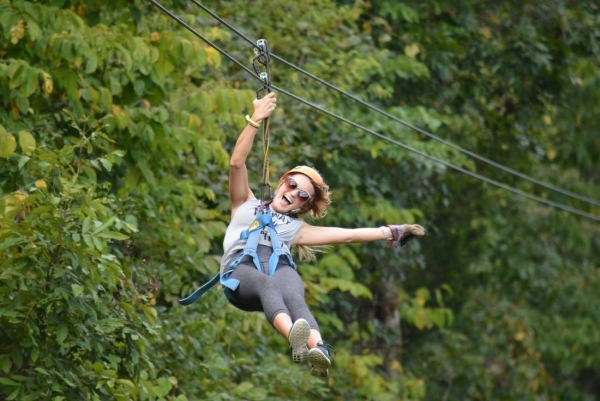 Below are some of the top 3 outdoor adventures in Branson that include scenic tour with the Branson Scenic Railway, water adventure at Table Rock Lake, and zipline adventure with the Adventure Ziplines of Branson. Branson Scenic Railway offers a perfect train travel adventure in the Ozarks that gives you the opportunity to see beautiful landscape of Branson and many other scenic spots. Travelling with Branson Scenic Railway is an exciting outdoor adventure for couples who want to experience seeing spectacular natural sceneries, wooded valleys, and picturesque Ozark mountains. The train takes passengers 3 to 4 times daily to the Ozark Mountains on a 40-mile round trip travelling mountainous locations that are inaccessible to cars. This train tour takes an hour and 45 minutes to complete. As the train tour nears its end and heads across the downtown area, you can have the opportunity to view many exciting city attractions such as theaters, live entertainment spots, outlet malls, and specialty shops. Table Rock Lake is a great destination where you can enjoy many exciting outdoor adventures on the water such as fishing, boating, swimming, scuba diving, kayaking, canoeing, and many other water adventures. This pristine lake boasts a shoreline of 750 miles and an area of 52,300 acres. The lake is also called a bass fishing lake where crappie, large bluegill, and bass are abundant. You will find many area resorts and marinas near the lakeside that can give you some information about fishing, boating, or scuba diving. These area resorts can help you get a guide to help make your water adventure full of fun and excitement. If you are a fishing enthusiast, you can join the local and regional fishing tournaments that are held regularly each year at Table Rock Lake. Adventure Ziplines of Branson is another top outdoor adventure destination that offers unique outdoor fun in Branson. This zipline operator has seven ziplines that each has a speed of up to 50 mph. This is the only zipline in Branson that is located within the city limits. Beautifully nestled in a full-featured zipline complex, Adventure Ziplines of Branson is only three blocks off of Branson’s famous Highway 76 Strip. From high atop the first 70-foot tower, you can take in a breathtaking view of the Ozark Mountains before zipping on to the rest of your adventure. This high-flying zipline is a favorite sports adventure of many families visiting Branson. So, if you want to enjoy outdoor fun in Branson when you visit the place soon, don’t miss to see these top 3 outdoor adventures in Branson.